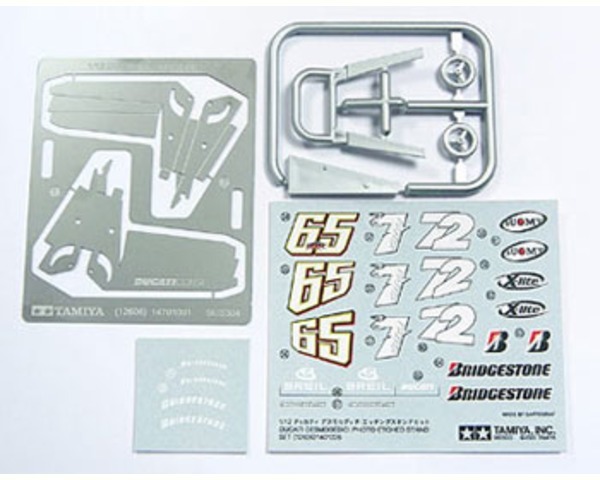 from the Tamiya Detail-Up Parts Series. Suitable for Ages 16 & Older. aluminum racing stand of the full-size Ducati. High quality plated polystyrene parts. Photo etched parts are made from real thin stainless steel. No.72 Ito (test rider), and tire markings for the 2005 season. A jig is included to aid in bending. Also available: Ducati Desmosedici Front Fork Set (TAMS2705).